For other uses, see Monk (disambiguation). "Monks" redirects here. For other uses, see Monks (disambiguation). Monastery of St. Dionysius on Mount Athos. In Eastern Orthodoxy monasticism holds a very special and important place: "Angels are a light for monks, monks are a light for laymen" (St. John Klimakos). Orthodox monastics separate themselves from the world in order to pray unceasingly for the world. They do not, in general, have as their primary purpose the running of social services, but instead are concerned with attaining theosis, or union with God. However, care for the poor and needy has always been an obligation of monasticism,[citation needed] so not all monasteries are "cloistered". The level of contact though will vary from community to community. Hermits, on the other hand, have little or no contact with the outside world. Orthodox monasticism does not have religious orders as are found in the West, nor do they have Rules in the same sense as the Rule of St. Benedict. 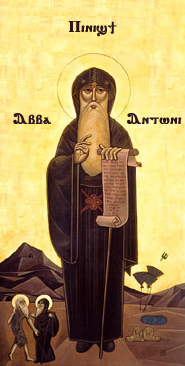 Rather, Eastern monastics study and draw inspiration from the writings of the Desert Fathers as well as other Church Fathers; probably the most influential of which are the Greater Asketikon and Lesser Asketikon of St. Basil the Great and the Philokalia, which was compiled by St. Nikodemos of the Holy Mountain and St. Makarios of Corinth. Hesychasm is of primary importance in the ascetical theology of the Orthodox Church. General view of Holy Trinity-Makaryev Monastery, on the Volga River in Nizhny Novgorod Oblast, Russia. Most communities are self-supporting, and the monastic’s daily life is usually divided into three parts: (a) communal worship in the catholicon (the monastery's main church); (b) hard manual labour; and (c) private prayer, spiritual study, and rest when necessary. Meals are usually taken in common in a sizable dining hall known as a trapeza (refectory), at elongated refectory tables. Food is usually simple and is eaten in silence while one of the brethren reads aloud from the spiritual writings of the Holy Fathers. The monastic lifestyle takes a great deal of serious commitment. Within the cenobitic community, all monks conform to a common way of living based on the traditions of that particular monastery. In struggling to attain this conformity, the monastic comes to realize his own shortcomings and is guided by his spiritual father in how to deal honestly with them. For this same reason, bishops are almost always chosen from the ranks of monks. In general, Orthodox monastics have little or no contact with the outside world, including their own families. The purpose of the monastic life is union with God, the means is through leaving the world (i.e., the life of the passions). After tonsure, Orthodox monks and nuns are never permitted to cut their hair. The hair of the head and the beard remain uncut as a symbol of the vows they have taken, reminiscent of the Nazarites from the Old Testament. The tonsure of monks is the token of a consecrated life, and symbolizes the cutting off of their self-will. The process of becoming a monk is intentionally slow, as the vows taken are considered to entail a lifelong commitment to God, and are not to be entered into lightly. In Orthodox monasticism after completing the novitiate, there are three ranks of monasticism. There is only one monastic habit in the Eastern Church (with certain slight regional variations), and it is the same for both monks and nuns. Each successive grade is given a portion of the habit, the full habit being worn only by those in the highest grade, known for that reason as the "Great Schema", or "Great Habit". Novice (Church Slavonic: Poslushnik), lit. "one under obedience"—Those wishing to join a monastery begin their lives as novices. After coming to the monastery and living as a guest for not less than three days, the revered abbot or abbess may bless the candidate to become a novice. There is no formal ceremony for the clothing of a novice, he or she simply receives permission to wear the clothing of a novice. In the Eastern monastic tradition, novices may or may not dress in the black inner cassock (Greek: Anterion, Eisorasson; Church Slavonic: Podriasnik) and wear the soft monastic hat (Greek: Skoufos, Church Slavonic: Skufia), depending on the tradition of the local community, and in accordance to the abbot’s directives. The inner-cassock and the skoufos are the first part of the Orthodox monastic habit. In some communities, the novice also wears the leather belt. He is also given a prayer rope and instructed in the use of the Jesus Prayer. If a novice chooses to leave during the period of the novitiate, no penalty is incurred. He may also be asked to leave at any time if his behaviour does not conform to the monastic life, or if the superior discerns that he is not called to monasticism. When the abbot or abbess deems the novice ready, he is asked if he wishes to join the monastery. Some, out of humility, will choose to remain novices all their lives. Every stage of the monastic life must be entered into voluntarily. Stavrophore (Church Slavonic: Krestonosets), lit. "Cross-bearer"—The next level for Eastern monastics takes place some years after the first tonsure when the abbot feels the monk has reached an appropriate level of discipline, dedication, and humility. This degree is also known as the Little Schema, and is considered to be a "betrothal" to the Great Schema. At this stage, the monk makes formal vows of stability, chastity, obedience and poverty. Then he is tonsured and clothed in the habit, which in addition to that worn by the Rassophore, includes the paramandyas (Church Slavonic: paraman), a piece of square cloth worn on the back, embroidered with the instruments of the Passion (see picture above), and connected by ties to a wooden cross worn over the heart. The paramandyas represents the yoke of Christ. Because of this addition he is now called Stavrophore, or Cross-bearer. He is also given a wooden hand cross (or "profession cross"), which he should keep in his icon corner, and a beeswax candle, symbolic of monastic vigilance the sacrificing of himself for God. He will be buried holding the cross, and the candle will be burned at his funeral. In the Slavic practice, the Stavrophore also wears the monastic mantle. The rasson (outer robe) worn by the Stavrophore is more ample than that worn by the Rassophore. The abbot increases the Stavrophore monk’s prayer rule, allows a more strict personal ascetic practice, and gives the monk more responsibility. Great Schema (Greek: Megaloschemos, Church Slavonic: Skhimnik)—Monks whose abbot feels they have reached a high level of spiritual excellence reach the final stage, called the Great Schema. The tonsure of a Schemamonk follows the same format as the Stavrophore, and he makes the same vows and is tonsured in the same manner. But in addition to all the garments worn by the Stavrophore, he is given the Analavos (Church Slavonic: Analav) which is the article of monastic vesture emblematic of the Great Schema. For this reason, the analavos itself is sometimes called the "Great Schema". The analavos comes down in the front and the back, somewhat like the scapular in Western monasticism, although the two garments are probably not related. It is often intricately embroidered with the instruments of the Passion and the Trisagion (the angelic hymn). The Greek form does not have a hood, the Slavic form has a hood and lappets on the shoulders, so that the garment forms a large cross covering the monk's shoulders, chest, and back. Another piece added is the Polystavrion or "Many Crosses", which consists of a cord with a number of small crosses plaited into it. The polystavrion forms a yoke around the monk and serves to hold the analavos in place, and reminds the monastic that he is bound to Christ and that his arms are no longer fit for worldly activities, but that he must labor only for the Kingdom of Heaven. Among the Greeks, the mantle is added at this stage. The paramandyas of the Megaloschemos is larger than that of the Stavrophore, and if he wears the klobuk, it is of a distinctive thimble shape, called a koukoulion, the veil of which is usually embroidered with crosses. In some monastic traditions the Great Schema is only given to monks and nuns on their death bed, while in others they may be elevated after as little as 25 years of service. Many (but not all) Orthodox seminaries are attached to monasteries, combining academic preparation for ordination with participation in the community's life of prayer, and hopefully benefiting from the example and wise counsel of the monks. Bishops are required by the sacred canons of the Orthodox Church to be chosen from among the monastic clergy. The requirement is specifically that they be monastics, not simply celibate (see clerical celibacy). Monks who have been ordained to the priesthood are called hieromonks (priest-monks); monks who have been ordained to the diaconate are called hierodeacons (deacon-monks). A Schemamonk who is a priest is called a Hieroschemamonk. Most monks are not ordained; a community will normally only present as many candidates for ordination to the bishop as the liturgical needs of the community require. The famed monastery of Jasna Góra is one of the last run by the Pauline Fathers, an important order in the history of the monastic tradition. Within Roman Catholicism, a monk is a member of a religious order who lives a communal life in a monastery, abbey, or priory under a monastic rule of life (such as the Rule of St. Benedict). St. Benedict of Nursia, (480-543 or 547 AD) is considered to be the founder of western monasticism. He authored the Rule of St. Benedict, which is the foundation for the Order of St. Benedict and all of its reform groups such as the Cistercians and the Trappists. He founded the great Benedictine monastery, Monte Cassino, in 529. The religious vows taken in the West were first developed by St. Benedict. These vows were three in number: obedience, conversion of life, and stability. Obedience calls for the monk to obey Christ, as represented by the superior person of the monastery, which is an abbot or prior. Conversion of life means, generally, that the monk convert himself to the way of a monk, which is death to self and to the world and life to God and to his work. A Christian monk is to be an instrument of God's work. Stability entails that the monk commit himself to the monastery for the remainder of his life, and so, upon death, will be buried at its cemetery. The vow of stability is unique to Benedictines. The solemn vows in other religious communities were eventually established as vows of obedience, poverty, and chastity. Poverty requires that they renounce any ownership of property or assets, except for items that were allowed to them by their superior (such as a religious habit, shoes, a cloak, etc. ), and to live meekly, sharing whatever they might have with the poor. Chastity requires that since they were willing to dedicate their lives to God, they sacrificed the love between men and women and would not marry. Also, they give up any act of sexual conduct. To become a monk, one first must become a postulant, during which time the man lives at the monastery to evaluate whether he is called to become a monk. As a postulant, the man is not bound by any vows, and is free to leave the monastery at any time. If the postulant and the community agree that the postulant should become a monk, the man is received as a novice, at which time he is given his religious habit, and begins to participate more fully in the life of the monastery. Following a period as a novice, usually six months to a year, the novice professes temporary vows, which can be renewed for a period of years. After a few years, the monk professes permanent vows, which are binding for life. The monastic life generally consists of prayer in the form of the Liturgy of the Hours (also known as the Divine Office) and divine reading (lectio divina) and manual labor. Among most religious orders, monks live in simple, austere rooms called cells and come together daily to celebrate the Conventual Mass and to recite the Liturgy of the Hours. In most communities, the monks take their meals together in the refectory. While there is no vow of silence, many communities have a period of silence lasting from evening until the next morning and some others restrict talking to only when it is necessary for the monks to perform their work and during weekly recreation. Monks who have been or will be ordained into Holy Orders as priests or deacons are referred to as choir monks, as they have the obligation to recite the entire Divine Office daily in choir. Those monks who are not ordained into Holy Orders are referred to as lay brothers. In most monastic communities today, little distinction exists between the lay brothers and the choir monks. However, historically, the roles of the two groups of monks within the monastery differed. The work of the choir monks was considered to be prayer, chanting the seven hours of the Divine Office and celebrating the Mass daily whereas the lay brothers provided for the material needs of the community by growing food, preparing meals, maintaining the monastery and the grounds. This distinction arose historically because generally those monks who could read Latin typically became choir monks, while those monks who were illiterate or could not read Latin became lay brothers. Since the lay brothers could not recite the Divine Office in Latin, they would instead pray easily memorizable prayers such as the Our Father or the Hail Mary as many as 150 times per day. Since the Second Vatican Council, the distinction between choir monks and lay brothers has been deemphasized, as the council allowed the Divine Office to be said in the vernacular language, effectively opening participation to all of the monks. Within western monasticism, it is important to differentiate between monks and friars. Monks generally live a contemplative life of prayer confined within a monastery while friars usually engage in an active ministry of service to the outside community. The monastic orders include all Benedictines (the Order of Saint Benedict and its later reforms including the Cistercians and the Trappists) and the Carthusians, who live according to their own Statutes, and not according to the Rule of St. Benedict proper. Orders of friars include the Franciscans, Dominicans, Carmelites, and Augustinians. Although the Canons Regular, such as the Norbertines, live in community, they are neither monks nor friars as they are characterized by their clerical state and not by any monastic vows. Monastic life in England came to an abrupt end when King Henry VIII broke from the Roman Catholic Church and made himself the head of the Church of England. He initiated the Dissolution of the Monasteries, during which all of the monasteries within England were destroyed. A large number of monks were executed, others fled to continental European monasteries where they were able to continue their monastic life. Shortly after the beginning of the revival of the Catholic Movement in the Church of England, there was felt to be a need for a restoration of the monastic life. In the 1840s, the then Anglican priest and future Catholic Cardinal John Henry Newman established a community of men at Littlemore near Oxford. From then on, there have been established many communities of monks, friars and other religious communities for men in the Anglican Communion. There are Anglican Benedictines, Franciscans, Cistercians, and in the Episcopal Church in the United States, Dominicans. There are also uniquely Anglican monastic orders such as the Society of Saint John the Evangelist and the Community of the Resurrection at Mirfield. Some Anglican religious communities are contemplative, some active, but a distinguishing feature of the monastic life among Anglicans is that most practice the so-called "mixed life". Anglican monks recite the Divine Office in choir daily, either the full eight services of the Breviary or the four offices found in the Book of Common Prayer and celebrate the Eucharist daily. Many orders take on external works such as service to the poor, giving religious retreats, or other active ministries within their immediate communities. Like Roman Catholic monks, Anglican monks also take the monastic vows of poverty, chastity, and obedience. In the early 20th century when the Catholic Movement was at its height, the Anglican Communion had hundreds[citation needed] of orders and communities and thousands of religious followers. However, since the 1960s there has been a sharp falling off in the numbers of religious in many parts of the Anglican Communion. Many once large and international communities have been reduced to a single convent or monastery composed of elderly men or women. In the last few decades of the 20th century, novices have for most communities been few and far between. Some orders and communities have already become extinct. There are however, still several thousand Anglican monks working today in approximately 200 communities around the world. The most surprising growth has been in the Melanesian countries of the Solomon Islands, Vanuatu and Papua New Guinea. The Melanesian Brotherhood, founded at Tabalia, Guadalcanal, in 1925 by Ini Kopuria, is now the largest Anglican community in the world with over 450 brothers in the Solomon Islands, Vanuatu, Papua New Guinea, the Philippines and the United Kingdom. Loccum Abbey and Amelungsborn Abbey have the longest traditions as Lutheran monasteries. Since the 19th and 20th century, there has been a renewal in the monastic life among Lutheranism. There are many present-day Lutherans who practice the monastic teaching of the Roman Catholic Church. In American Lutheran traditions, "The Congregation of the Servants of Christ" was established at St. Augustine's House in Oxford, Michigan, in 1958 when some other men joined Father Arthur Kreinheder in observing the monastic life and offices of prayer. These men and others came and went over the years. The community has always remained small; at times the only member was Father Arthur. During the 35 years of its existence over 25 men tested their vocations to monastic life by living at the house for some time, from a few months to many years, but at Father Arthur's death in 1989 only one permanent resident remained. At the beginning of 2006, there was 2 permanent professed members and 2 long-term guests. Strong ties remain with this community and their brothers in Sweden (Östanbäck monastery) and in Germany (Priory of St. Wigbert). There is also the Order of Lutheran Franciscans, a religious community of friars and sisters within the tradition of the Evangelical Lutheran Church in America. In Theravada Buddhism, bhikkhu is the term for monk. Their disciplinary code is called the patimokkha, which is part of the larger Vinaya. They live lives of mendicancy, and go on a morning almsround (Pali: pindapata) every day. The local people give food for the monks to eat, though the monks are not permitted to positively ask for anything. The monks live in monasteries, and have an important function in traditional Asian society. Young boys can be ordained as samaneras. Both bhikkhus and samaneras eat only in the morning, and are not supposed to lead a luxurious life. Their rules forbid the use of money, although this rule is nowadays not kept by all monks. The monks are part of the Sangha, the third of the Triple Gem of Buddha, Dhamma, Sangha. In Mahayana Buddhism, the term 'Sangha' strictly speaking refers to those who have achieved certain levels of understanding. They are therefore called 'community of the excellent ones' (Standard Tibetan: mchog kyi tshogs); however, these in turn need not be monks (i.e., hold such vows). Several Mahayana orders accept female practitioners as monks, instead of using the normal title of "nun", and they are considered equal to male ascetics in all respects. Chinese Buddhist monks have been traditionally and stereotypically linked with the practice of the Chinese martial arts or Kung fu, and monks are frequently important characters in martial arts films. This association is focused around the Shaolin Monastery. The Buddhist monk Bodhidharma, traditionally credited as the founder of Zen Buddhism in China, is also claimed to have introduced Kalaripayattu (which later evolved into Kung Fu) to the country. This latter claim has however been a source of much controversy (see Bodhidharma, the martial arts, and the disputed India connection) One more feature about the Chinese Buddhist monks is that they practice the burning marks on their scalp, finger or part of the skin on their anterior side of the forearm with incense as a sign of ordination. Most of the austerities and ascetic practices can be traced back to Vardhaman Mahavira, the twenty-fourth "fordmaker" or Tirthankara. The Acaranga Sutra, or Book of Good Conduct, is a sacred book within Jainism that discusses the ascetic code of conduct. Other texts that provide insight into conduct of ascetics include Yogashastra by Acharya Hemachandra and Niyamasara by Acharya Kundakunda. Other illustrious Jain works on ascetic conduct are Oghanijjutti, Pindanijjutti, Cheda Sutta, and Nisiha Suttafee. The Svetambar Terapanthi sect has a new rank of junior monks who are called samana. The nuns are called Aryikas in Digambar tradition and Sadhvi in the Svetambar tradition. Hinduism has many monastic orders, including the Dashanami Sampradaya ("Tradition of Ten Names") orders established by Adi Shankara as well as Vaishnava orders. Madhvaacharya (Madhvacharya), the Dwaita philosopher, established ashta matha (Eight Monasteries). He appointed a monk (called swamiji or swamigalu in local parlance) for each matha or monastery who has the right to worship Madhvacharya's murti of Lord Krishna by rotation. Each matha's swamiji gets a chance to worship after fourteen years. This ritual is called Paryaya and has been used also outside his sampradaya, e.g. in Gaudiya Vaisnava Radharamana temple in Vrindavan. Similar in appearance to Buddhist monks, brahmacari monks from the International Society for Krishna Consciousness (ISKCON), or Hare Krishnas as they are popularly known, are the best known Vaishnava monks outside India. They are a common sight in many places around the world. Their appearance—simple saffron dhoti, shaved head with sikha, Tulasi neckbeads and tilaka markings—and social customs (sadhana) date back many thousands of years to the Vedic era with its varnasrama society. This social scheme includes both monastic and lay stages meant for various persons in various stages of life as per their characteristics (guna) and work (karma). Into Great Silence — The award-winning documentary on the hermit monks of the Roman Catholic Carthusian Order. ^ Order of Saint Benedict. Retrieved 13-01-10. ^ The Lonely Lutheran Monk, TIME Magazine (March 1, 1963). Retrieved 13-01-10. ^ "Mongolia – Buddhism". Library of Congress Country Studies. Historyfish.net Texts and articles on Western Christian Monks, Monastics, and the Monastic Life.